Recently we headed south and took a ride on the Brussels ferry ate at the wonderful Wittmond hotel then checked out the rest of the town. One little building caught our attention and I had to stick my head in. The building was the historic jail that originally called “the calaboose” by the locals. I had to pose in the doorway of this little jail that was built about the same time the town’s boundaries were established. Brussels is located in an unglaciated part of the state on the tip of the peninsula formed by the Mississippi and Illinois Rivers and is almost completely surrounded by water. 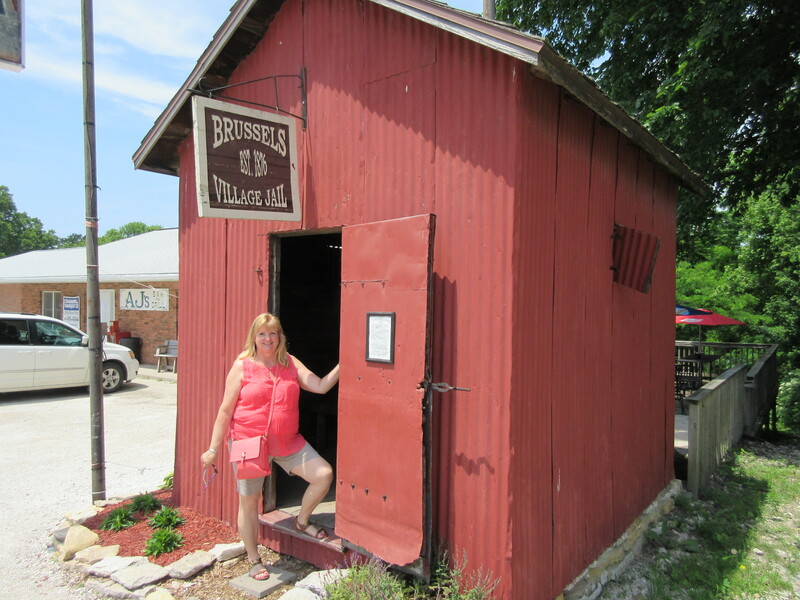 Being located at the southern tip of the peninsula the village of Brussels was first settled by German immigrants in 1822. They were pulled to this area because the fertile land, the water supply and nearby forests. Because there are no railroads or bridges into Calhoun County’s Brussels Illinois has always been sparsely populated and the population has never been more that several hundred. The small population helps the community retain its small town feel and yesterday aura. The calaboose/jail had an update when they added corrugated iron was added in 1889. History says that the jail was mostly used to house men overnight for drinking too much beer. Since there is a pub right next door if someone gets rowdy they could do it again! Since the ferry only runs until the end of September, make plans to head south this summer and enjoy the beauty and history of Brussels. Log onto http://www.greatriverroad.com/cities/Brussels/brusselsCover.htm for more information. Next Post: Traveling Tractors – all for a good cause!